New Year’s Day 2013 may already be a blur in the rear-view mirror. A handful of well-meaning resolutions may already have fallen by the wayside. Still, it’s not too late to decide to make a positive change this year. NewGrass® synthetic grass is here to help. We have some eco-friendly resolutions! Drought conditions are continuing nationwide and concerns about the use of pesticides and a desire for more organic living are growing. In response, NewGrass® synthetic grass lawn offers 5 resolutions for a more eco-friendly life in 2013. If five resolutions sounds a little daunting, don’t worry. They are achievable by replacing turf grass with NewGrass®. It is the synthetic grass of choice when water conservation and environmental consciousness are as important as having a green lawn year-round. A NewGrass® synthetic lawn requires no watering other than an occasional hosing to keep it free of dust and debris. And even that use of water goes away if you use a rake or leaf blower instead. Public agencies, homeowner associations and local and state governments from coastal Maine to North Carolina to Alaska are increasingly restricting the use of lawn chemicals to protect drinking water supplies, streams and rivers. “It’s common sense,” says our NewGrass president. “If you’re concerned about protecting your groundwater, streams and lakes, you’ll at least reduce if not eliminate the use of many kinds of chemical pesticides and fertilizers. NewGrass gives you the opportunity to do that.” Seems like NewGrass provides fantastic eco-friendly resolutions. Rooftop patios and terraces as well as urban thumbprint parks have benefited from the use synthetic grass. In New York City, NewGrass® has been relied on for applications as varied as a rooftop patio of swanky Trump Place and the ground cover of a 0.1-acre temporary indoor “pop-up park,” reported on by The New York Times. In Atlanta, the producers of the TV show Movie and a Makeover replicated a backyard patio complete with lawn on an Atlanta rooftop using NewGrass®. NewGrass® is a great choice for a rooftop terrace. Because even when it’s wet, a NewGrass® install won’t exceed a building’s weight-being limitations. A quality synthetic grass lawn gives you a surface that feels so natural your favorite canine friends will love to play on. But they won’t be able to damage it, no matter how much they romp. And your synthetic grass won’t yellow, no matter how often your pets need to answer Mother Nature’s call. You’ll also save time because it’s easier to pick up after your dog. In fact, this is one reason NewGrass® is a feature of the Tony Applewood Pet Resort. Also, you can find us in the Scottsdale and Phoenix Boulder Falls Pet Resort. Seems like NewGrass creates no dead spots, holes or muddy spots. In addition, the inorganic glass blades of NewGrass eliminate bacteria and diseases and stifle fleas, ticks and other pests. Hence, so many eco-friendly resolutions with so many benefits! Natural grass and its weeds aggravate allergies. In addition to their need for fertilizers, pesticides, watering and maintenance, grass can stir things up. Sand and wood chips create cushiony surfaces, but both are messy, scatter easily and routinely need replenishing. Perhaps least appealing of all, sand and wood chips can attract cats. Consequently, cats consider these coverings to be one big litter box. So why go with an synthetic lawn? A quality synthetic grass is the optimal choice for ground covering for your children’s play set. NewGrass® lawns, for example, are lead-safe and hypo-allergenic. Also, they don’t stain clothes. In addition, they prevent dirt and mud from being tracked inside. And finally, eliminate injuries that a fall on gravel, sand or dirt can cause. 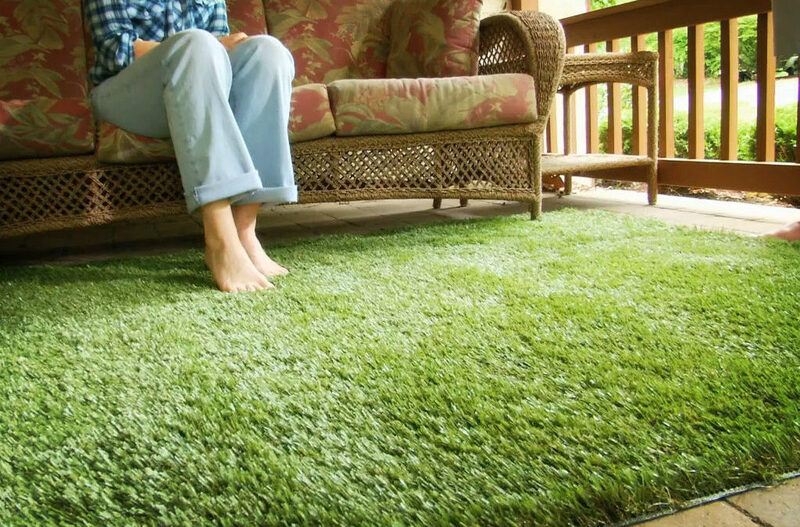 So not only does it provide eco-friendly resolutions, synthetic grass is safe! So if all of this sounds wonderful to you, contact us. There is no time like the present. Furthermore, you will be glad you did. Want to be eco-friendly? Choose NewGrass!